The rather big sunspot 1040, which was also captured by the SOHO spacecraft on Jan. 15 has just disappeared over the sun’s western limb, currently leaving the visible disk of the sun blank once again in this uncharacteristically long solar minimum. But our old friend, sunspot 1039 should be showing up soon, as the sun rotates around. We know it is still there, because the STEREO spacecraft can show us what is going on the sun’s far side. 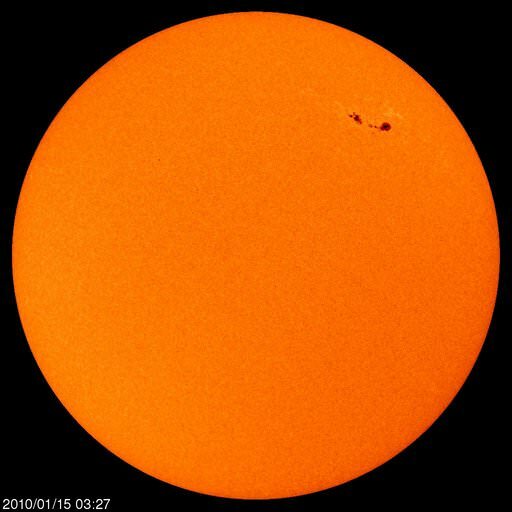 Sunspot 1039 should emerge for direct viewing from Earth within the next 48 hours. Spaceweather.com encourages those amateur astronomers with solar telescopes to monitor the Sun’s east limb for developments. STEREO B captures the largest solar flare in two years. Click for larger movie. Additionally on Jan. 19th at 1340 UT, STEREO-B recorded the strongest solar flare in almost two years. Click the image to see the action on an ultraviolet movie of the blast. The M2-class eruption came from sunspot 1039, so that sunspot is likely still very active. Spaceweather.com said that considering the sunspot was not even visible from Earth at the time of the eruption, the flare was probably much stronger than its M2 classification would suggest. This active region has produced at least three significant eruptions since Jan. 17th and it shows no signs of cooling off.